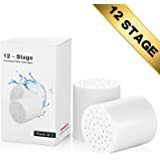 EFFICIENT 8-STAGE FILTRATION - A unique blend of different stages that efficiently filter out harmful substances before the water touches your skin. 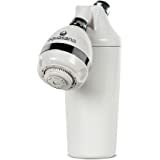 PURIFIES YOUR WATER - Removes Chlorine, heavy metals, bacteria, pesticides, and inhibits the growth of algae, fungi, and mold. Elimination of odor and improvement of water taste. This is perfect for people with sensitive skin, young children and babies. QUICK AND EASY TO ASSEMBLE - Its ‘easy twist and screw’ method allows a straight forward and quick installation. Instructions included. 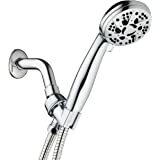 UNIVERSAL - Can be used with any Overhead Shower Head, Handheld Shower or Shower Combo. Comes with easy to replace 8 Stage Shower Filter Cartridge. 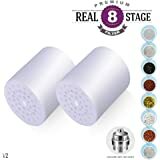 U-PY 8-Stage Replacement Universal SPA Shower Filter Cartridge - Dual Pack 1-Year Supply (No Housing) - Removing Chlorine and Heavy Metals. High Output. Gentle to Skin and Hair. 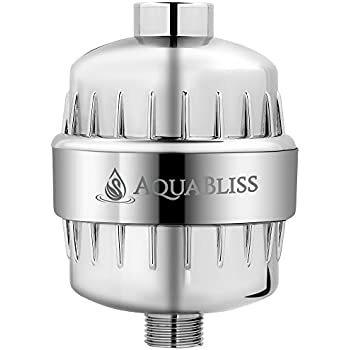 Unlike other shower filters, we use a specialized blend of activated coconut carbon, Calcium sulfite, Polypropylene Cotton, Biocera Ceramic Balls and a high-purity copper-zinc alloy known as KDF-55. 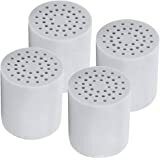 Granulated Activated Coconut Carbon - filters are most effective at removing radioactive iodine 131, chlorine, trihalomethanes (THMs), chemicals, impurities and Volatile Organic Chemicals (VOCs) from the water. 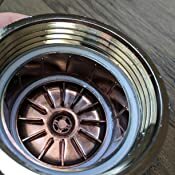 KDF Process Media (KDF-55) - are high-purity, granulated copper and zinc-based alloys for removing chlorine and water-soluble heavy metals, and it controls scale, bacteria and algae, even in hot water. 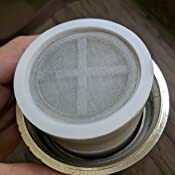 Polypropylene Cotton - filter contains a unique structure and its surface is 3-8 times bigger than ordinary filters, which is effective at removing turbidities, sediment, rusts and microorganisms. Calcium Sulphite - is 100 times more effective than activated carbon at removing chlorine and heavy metals such as lead, mercury, cadmium and aluminium. Biocera Ceramic Balls - are manufactured from a variety of functional ceramic materials. They adsorb impurities and harmful heavy metals and help human metabolism and natural healing. All of these elements are protected by a steel-mesh on both sides of the filter which act not only as a protective shield but even filter out dust and other such bigger particles passing through your water. Brittle hair and dry skin is very often a result of heavy sediments in shower water. 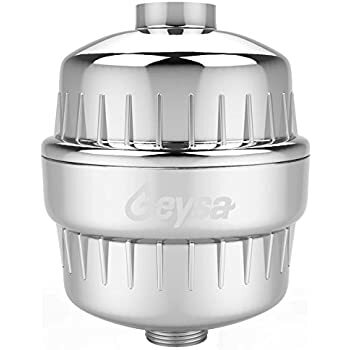 Our customers happily report how they are experiencing smoother, sleeker hair and more supple skin from head to toe after installing a Geysa shower filter. My water supply is from Lake Michigan--very hard water. 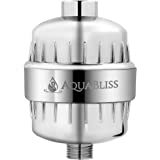 I ordered the filter because chlorine and heavy metals are absorbed through the skin. 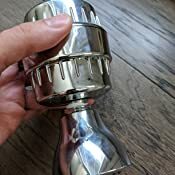 After my first shower with the filter installed, I gently stroked my arm and could feel a big difference in skin softness. My hair is also softer after shampooing. What a difference for such a reasonable price! 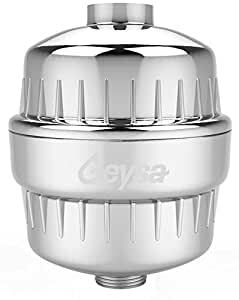 Buying the Geysa shower filter is one of the best things I've done for myself! Item arrived quickly and in good packaging. We have noticed a substantial difference in how our hair & skin feel after having installed this for more than two weeks. Our water is extremely hard, so having a purifier has helped with reducing some of the ill effects our our local water issues. As a filter I find it perfect for my needs. As plenty of other reviews here say the water is softer and the works as advertised. 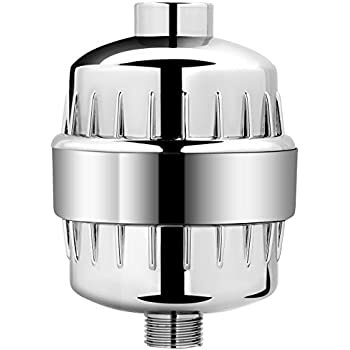 I bought 2 of these to work with my existing shower heads. But foolishly I didn't check to see how the shower heads themselves mounted to the shower. 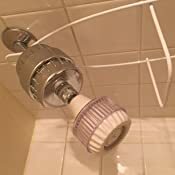 One of mine, has the ball and socket directly at the part of that screws into the shower (or in this case the filter). Unfortunately it needed more screw-in space than this filter provides. I don't really blame the filter, but more of the strange design of the head. I was easily able to go by the local HD and find a replacement head that uses the more standard mount that fit just fine. 5.0 out of 5 starsThis is the best! This shower filter was super easy to install. I didn't need any of the tape or make any really note-worthy adjustments. 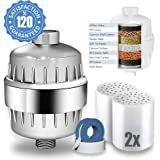 I just put the filter into the main unit and then screwed it into my shower set up. I ran the water for about 5 minutes and used that time to make minor adjustments and to just let the water run through the filter. Initially the water came out gray and then cleared to crystal. I took a shower later in the day after doing my chores and I did notice that the water didn't have the strong chlorine smell that it normally does. Also, my soap lathered rather well. After my shower, my skin was not as dry as it normally is and the body lotion that I applied went on like butter. My son touched my arm later that day in the car and said that my skin felt like a baby's. I'm going to chalk that up to the filter for now. So far, I love it and can tell the difference in how my water is based on how my soap lathered and my skin responded. Five stars!! Our well water is mineral-rich and very alkaline. We use a carbon block whole house filter but for some reason the shower retains a hydrogen sulfide odor. This shower mount filter with 2 stage carbon and KDF filtration has successfully removed the sulfur odor. In addition, soaps seem to lather better and I have noticed an improvement in the hard water scale build up. 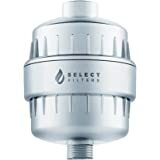 This filter has provided a simple and effective fix for a problem we have battled for years. 5.0 out of 5 starsSmartest ourchase we have made! We bought this hoping it would improve our water quality to a small degree. Well we got more than we bargained for! 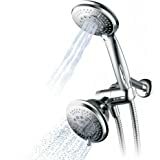 Wow, the very first time I stepped under the shower I felt the difference, my hair and skin felt cleaner and less dry. Absolutely no reduction in water pressure. Love it so much, bought another for our second shower! Oh, and the people from TGC actually sent me an e-mail asking if everything was okay and if we had any questions! 5.0 out of 5 starsThank you for giving me my health back! We bought two of these for our house. They installed in minutes and have improved our life tremendously. 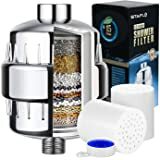 We were looking for hard working shower filters because our city water is of very low quality. We were particularly looking for a filter with KDF-55 because we live in an area that was heavily fracked for the last several years. 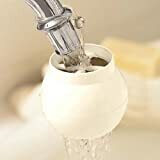 The water coming from our taps was sometimes gray in color, smelled bad and stung our skin and our throats in the shower. The first day we used these shower heads, we saw an incredible change. Our skin no longer burns or itches and my eczema is clearing up. Not to mention the other benefits like very soft hair and skin. I would like to thank Geysa for giving us our health back and at such a low price! 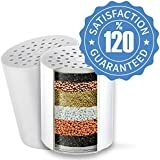 I have been recommending these filters to everyone! I just moved into a new apartment where the water is very hard, and I already have pretty sensitive skin. 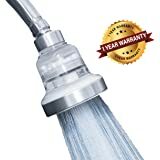 I honestly didn't know anyone made filters for shower heads, but I'm sure glad they're available. After just one shower I was pleased to notice less irritation from the hard water. Installation was a breeze, although I, like other reviewers, experienced a blue fluid leaking from the filter upon first attaching it. Once it was screwed on, everything worked just fine though. Very very minimal drop in water pressure, and I don't even notice it anymore. I hope this filter lasts quite a while. For the price, I am extremely pleased.